I can’t believe I went 38 years without ever trying pour-over coffee. Believe me, after trying it, I can tell you that I was missing out. 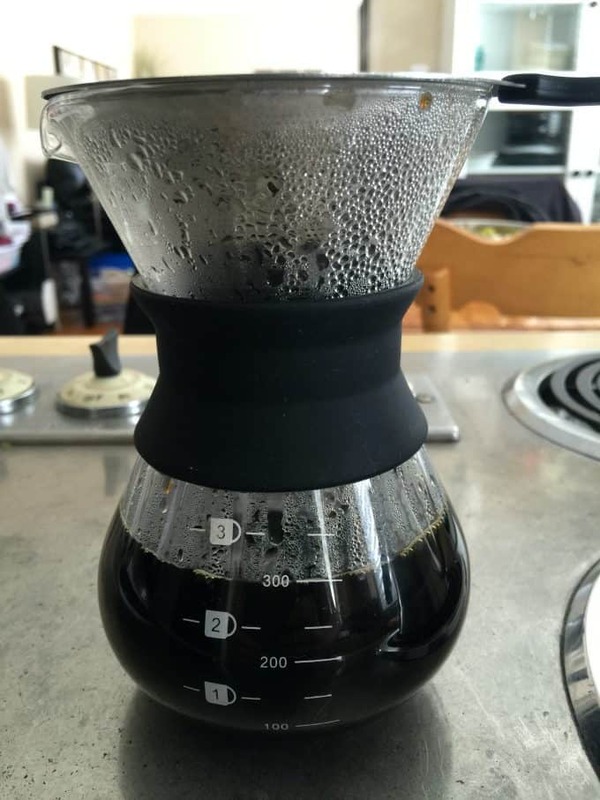 Kitchables recently sent me their Pour-Over Coffee Set to test out. I was curious about it and wondered what the difference would be from my regular way of making coffee in my coffee maker. Coffee fuels my day and it’s an understatement to say I drink a lot of it! It’s something I could never give up because I adore it so much. Before I get into telling you about the coffee itself, let me first share what’s in Kitchables Pour Over Coffee Set. 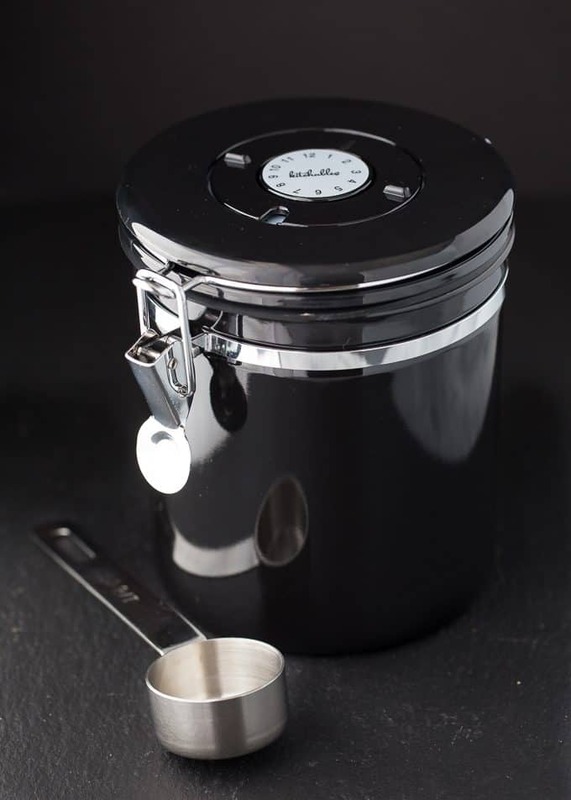 The first item is this sleek Coffee Canister used to store your coffee beans and keep them as fresh as possible. It also comes with a 1/8 cup measuring scoop. I like that it’s nice and big and stores a lot of coffee beans – up to 1 lb of coffee beans or 0.9 lb of ground coffee. It’s better to use a canister like this one versus keeping your beans stored in a bag in your cupboard. With coffee beans, you have to watch out for multiple factors that affect the taste like oxygen, moisture, carbon dioxide and light. 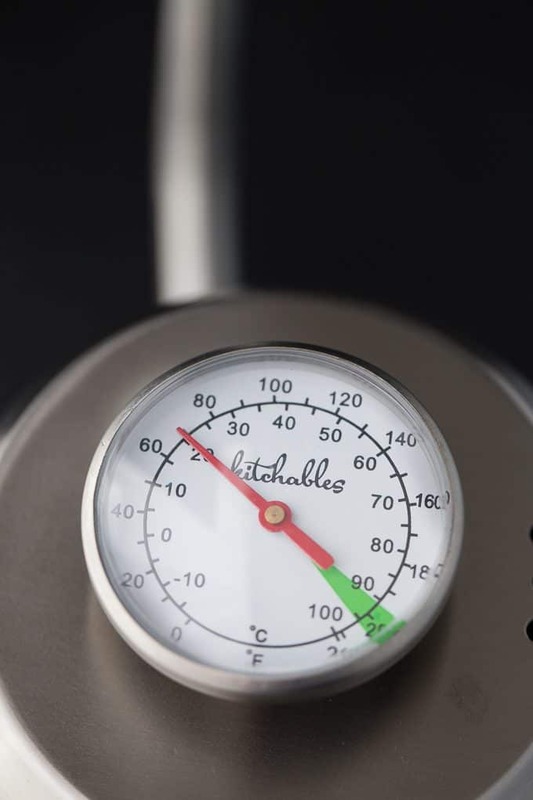 The Kitchables Coffee Canister has a built-in Co2 AirFresh valve. This allows carbon dioxide to escape one-way and the airtight seal keeps oxygen out. Your beans will stay fresher much longer. It even has a calendar wheel on top so you can keep track of the expiry date. Store it away from heat and light and you are good to go! I’ve heard of tea kettles, but never a coffee kettle until now. You’ll love having this Kitchables Coffee Kettle when you prepare your pour over coffee. For starters, it’s a stylish accessory to match many types of kitchen decor. I keep mine on my stove because I love how it looks. The main benefit is how it heats the water to the perfect temperature required to make a mean cup of coffee. It has a built-in thermometer so you’ll always know when your water has reached the proper temperature. No more guessing! It actually is highlighted green so you can’t miss it. To use, just heat it up on the stove. It’s designed to work with all types of stove tops from gas to induction. Mine is just a regular electric stove and it worked great for me. The gooseneck spout makes for an easy pour. 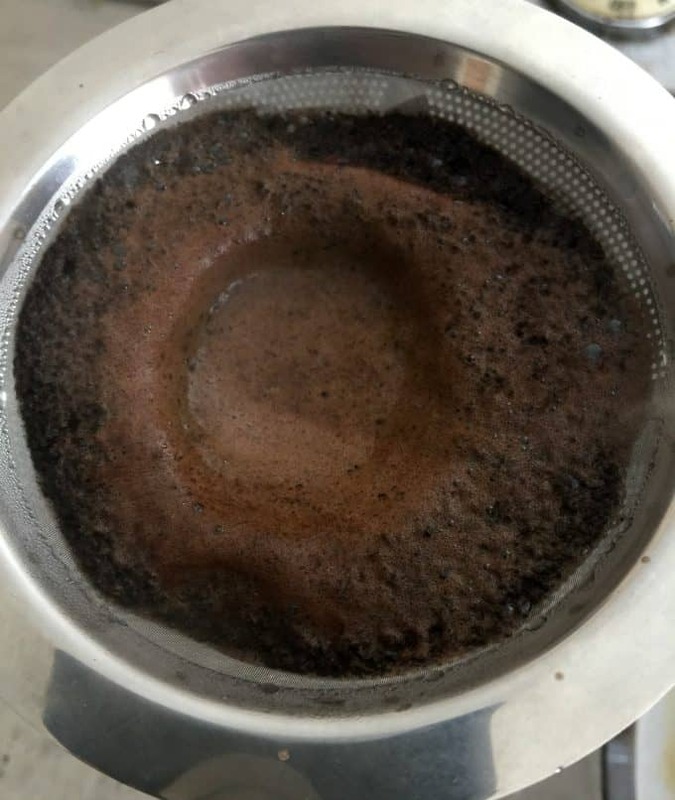 If I was using my other kettle, it would be too easy to dump too much water in the Pour-Over Coffee Maker and ruin my cup of coffee. I also like how the handle is insulated so you don’t have to worry about burns on your hands while you are preparing your coffee.Pick one up on Amazon.com. The star of the show is the Kitchables Pour-Over Coffee Maker. The ground coffee goes in the permanent stainless steel filter at the top. I like that it doesn’t need a paper filter which can sometimes leave your coffee with a weird taste. The base where the coffee will go is made of premium heat resistant borosilicate glass that is also scratch and shatter resistant. Another bonus is that it’s easy to clean. You don’t have to descale or take it apart or fiddle with tiny parts to clean it. Just wash it in the sink like normal. Once you buy it, that’s it. There’s no extras that you’ll have to purchase down the road to keep using it. Pick one up on Amazon.com. Making a cup of coffee is straightforward. The ground coffee beans go at the top in the filter. Then water is carefully poured with your Kitchables Coffee Kettle into the filter. It takes about 3 minutes to make a coffee. I know it’s a bit more effort than you are used to, but the taste is well worth it. It’s pure, intense and delicious. I was surprised at how good the coffee was and immediately knew this product was a keeper. Plus, there’s something soothing about taking the time to prepare a cup of coffee. I found it relaxing to focus a few minutes out of my day to make myself a cup. The end result was so satisfying and it was cool to be a big part of the brewing process. I drank this whole pot myself and then made more so John could try it too. Even he was impressed with how deep and flavourful the coffee was. 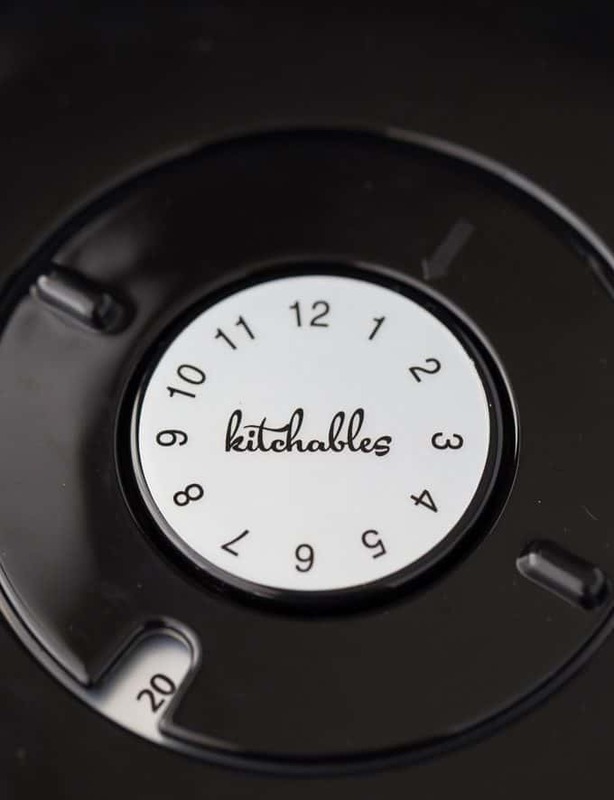 If you have a coffee lover on your holiday list, pick them up some Kitchables products. They will be in for a real treat with this set! It would also make a nice hostess gift or wedding gift. I’m sharing mine with my friends and family that come over to visit so they can experience the difference in taste too. Kitchables is having a holiday sale right now. Visit Kitchables on Amazon to take advantage of it. I also have a coupon code for you to use on Amazon to save 15% off Kitchable products: SMPSTA15 and it’s good until the end of 2017. 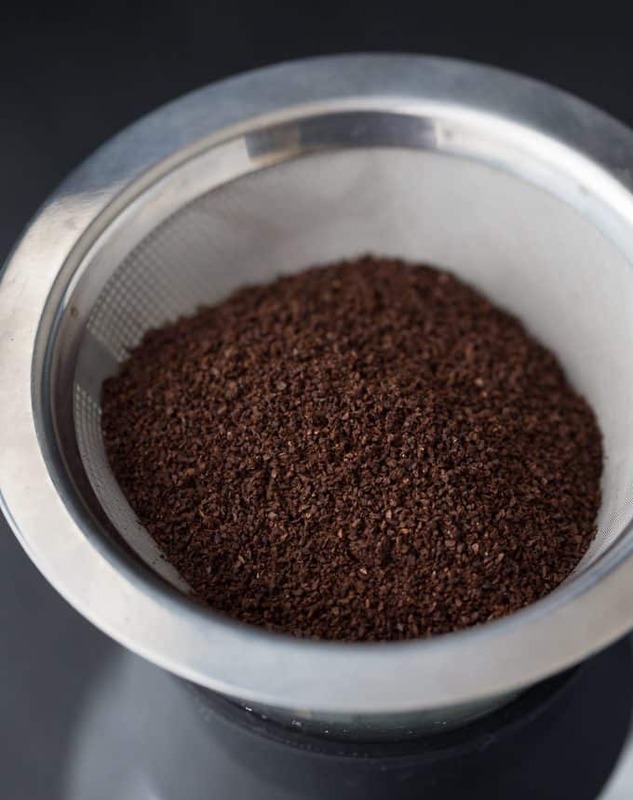 Have you ever tried pour-over coffee? Disclosure: I received a sample to facilitate this post. All opinions are my own. I like the double wall espresso cups shot glasses. 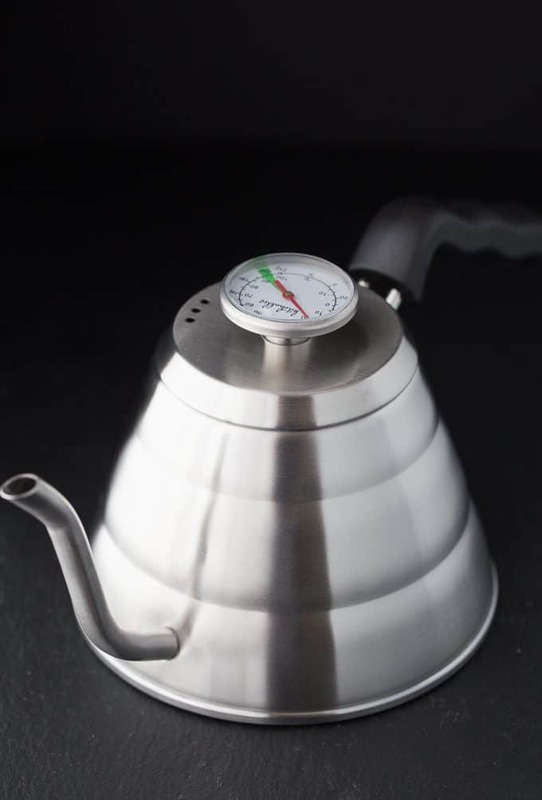 Pour Over Gooseneck Coffee Kettle with Thermometer. I learned they have free shipping on orders of $35. I would love to win this coffee set ! I like the glass tea cups – double wall insulated teacup. 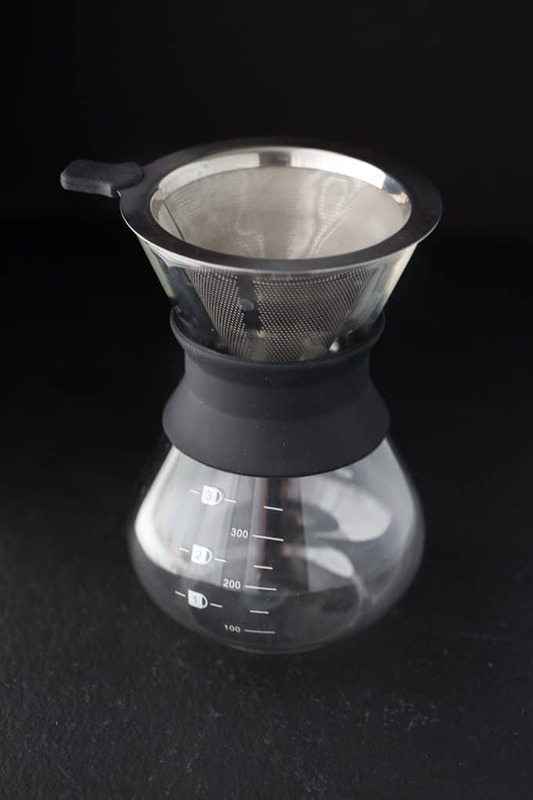 I like the Hand Drip Pour Over Glass Coffee Maker (2 Cup).